September 1940. 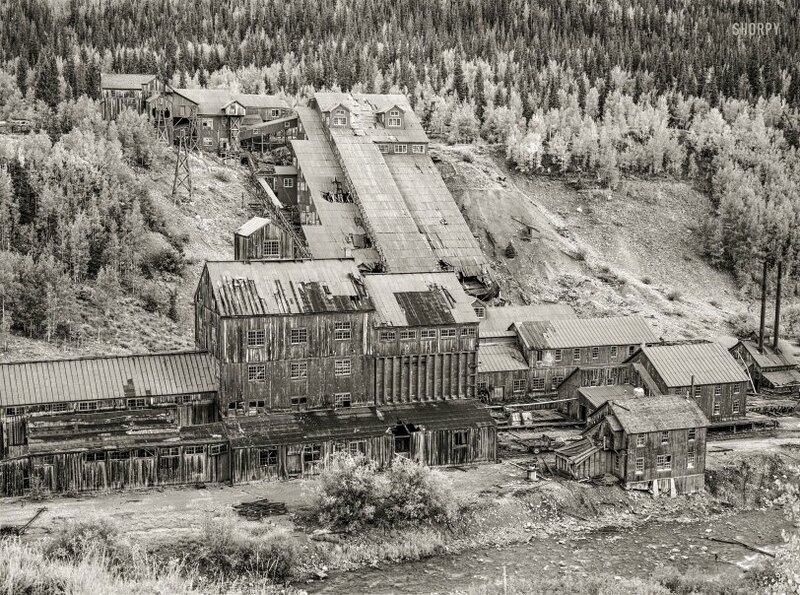 "Abandoned gold mill east of Silverton, San Juan County, Colorado." Medium format negative by Russell Lee. View full size. Submitted by DRGW476 on Sun, 09/09/2018 - 2:39am. This is the Silver Lake Mill along the old Silverton Northern RR line to Animas Forks. It stands at the foot of Arrastra Gulch. Behind the photographer on the west bank of the Rio de las Animas is the Mayflower Mine, which can still be toured. There's a lot less of the Silver Lake Mill left than shown here. An excellent reference to the area is The Rainbow Route by R. Sloan and C. Skowronski (Denver: Sundance, 1975). I model the areas around Silverton in HOn3. Submitted by BethF on Mon, 09/03/2018 - 2:01pm. I was trying to find out which mine this was, but it was rather like trying to find a needle in a haystack because there were a LOT of mines, both gold and silver, in that area. A few years ago, however, the hazards of all that mining became a very pressing concern. There are over 20,000 mines burrowed into the mountains in Colorado. It's really only a matter of time before something like this happens again, which is horrid news for the environment and for wildlife in Colorado. Submitted by urcunina on Mon, 09/03/2018 - 11:44am. About 1948, at age 14, my friend's dad would drive into the mountains near Denver and stop where there were mill tailings. We would take a batch home, crush the rock, and pan for gold with a pie tin. Over time, we collected about an ounce of gold flakes. Gold at that time was price-controlled at $35 an ounce. Submitted by rivlax on Mon, 09/03/2018 - 8:40am. Just look at all the effort that went into building those buildings. Look at the many windows in that structure on the incline, and think that this was all done without power tools, not counting the sawmill that milled the lumber. It boggles the mind to think what our ancestors could do with the tools and resources they had.